Kumburnu Beach and find yourself in the warm water and wonderful nature of Kumburnu. Boats setting off from Belcekız Beach would be a good option to see the unique bays of Ölüdeniz (Blue Cave, Butterfly Valley, Gemiler Bay, Aquarium Bay, Camel Beach and Cold Water Cave). In addition to all types of water sports; safari, mountain climbing and canoeing options are available in the area and also you can see this wonderful scenery from the sky by paragliding with professional teams. Due to its high altitude, Hisarönü has a cool and clean air. During daytime, you can enjoy the green and the forest and then join the colourful nightlife. Kaya Village actually has a history of 5.000 years. Although it was destroyed during the Fethiye Earthquake in 1957, it still contains a great history. Listed as a 3rd Degree Urban and Archaeological Site, Kaya Village preserves its special texture. The village is used for both settlement and touristic purposes. One of the mountains is covered with the ancient city and the other mountain is inhabited by the locals. You can see a number of wineries in the village which was called “Levissi” by the Greek. And also the most famous Kebab restaurants of Fethiye area are here. Lycian Way Hiking Trail is the first long distance hiking route of Turkey. It is approximately 535 km long. It is a road from Fethiye to Antalya which was known as the Lycian Way in history and it was created by marking and mapping the paths on the Teke Peninsula. It is one of the favourite destinations for the nature lovers and adventurers. One of the 100 Mountains in Turkey which are conserved as World Heritage, the Butterfly Valley was listed as 1st Degree Protected Site and all kinds of constructions are prohibited. As its name suggests, it contains one hundred butterfly species. Unfortunately, it is not accessible with a land vehicle. 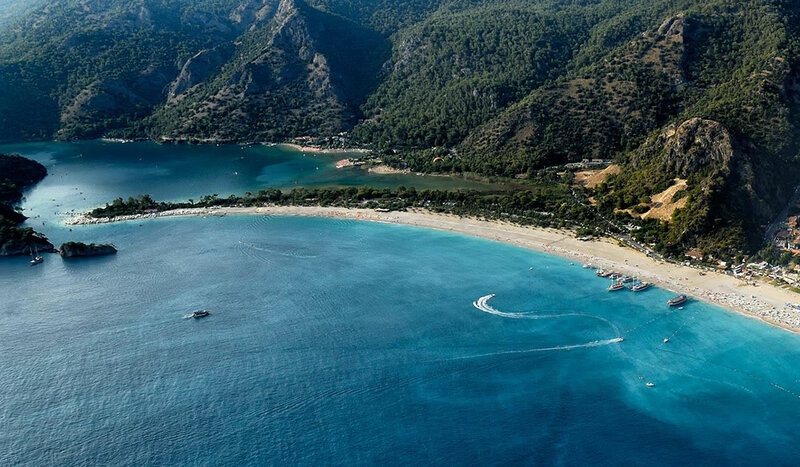 You can reach the valley only by boats from Ölüdeniz Beach. Located in the east of Ölüdeniz, the Kabak Bay and Faralya are among the rare untouched natural wonders. Both locations which are listed as protected areas are intertwined with history. You cannot see any walls or business on the beach where construction is strictly prohibited. Gemiler Island is one of the islands of Fethiye which can be reached through Kaya Village. There are 5 churches from the Byzantine Empire on the island. You can go to the island with your own vehicle or if you want to go on a boat trip, you can see the island which is one of the stops. Located in Hisarönü, the largest horse farm of Fethiye is open to visitors. You can ride horses after a short training and spend your day at the restaurant in the farm. This amusement park, which is the largest Aquapark in Fethiye, attracts both adults and children. We invite you here to have a colourful day in your holiday. There are also a restaurant and cafeteria where you can have some meals. The boats that set off from Ölüdeniz stop at 6 places. Starting at 10.30 in the morning, the boat stops at Blue Cave, Butterfly Valley, Aquarium Bay, Gemiler Island, Camel Beach and Cold Water Cave. You can wander around the islands during these stops.